Well, I admit I've been a bit scarce these last few months. Here it is already the last day of 2013… I'm planning on being better about this blog next year. This bike was purchased from a local artist who had come by it many years back in a poker game. It is a gorgeous example of this particular bike. 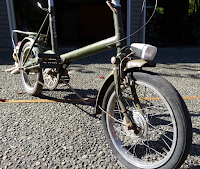 While it does have a few "love marks" and the Dynohub appears to not be functioning, overall the bike is in pretty good shape and lacks the cancerous rust that usually plagues vintage steel bikes. 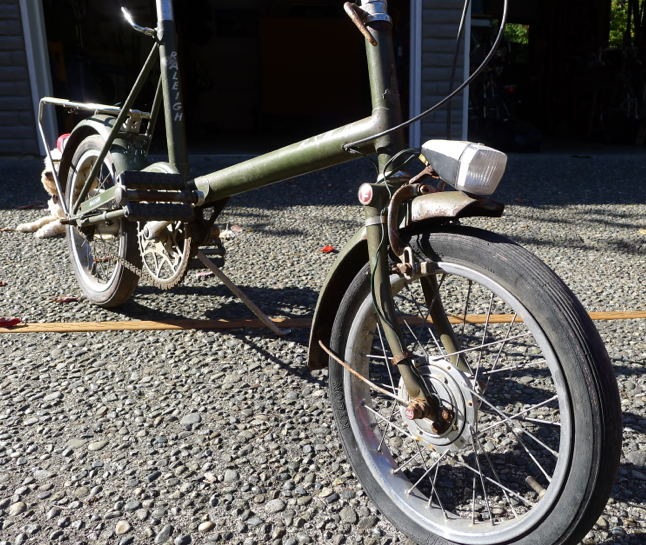 I won't replicate the history of this bike… Sheldon Brown has it covered HERE. I particularly love the original brochure scan that shows this bike, exactly and in this color. 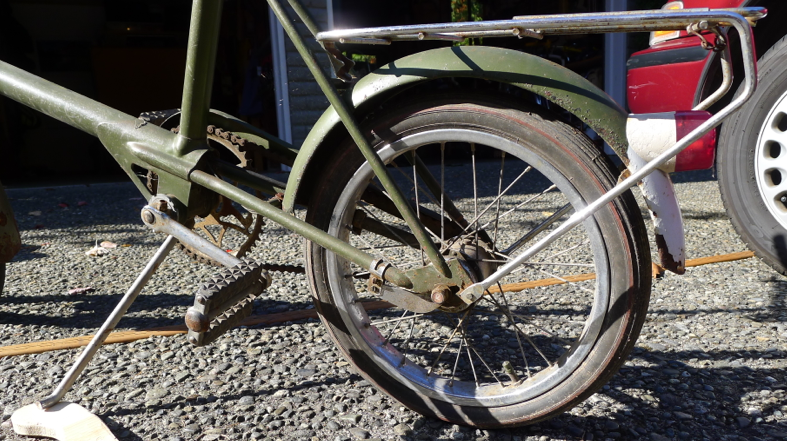 HERE is another great history of the bike. Above is a shot from the front. 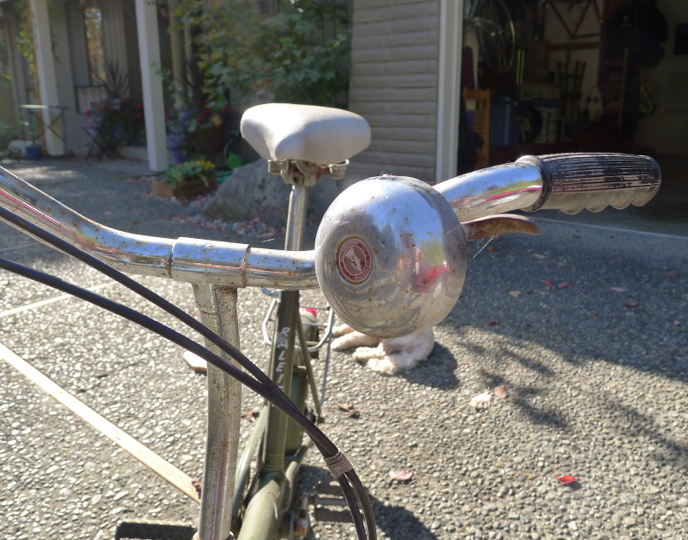 Notice the original lamp mounted on the fender… typically, in others I've seen, the mounting is rusted away due to moisture coming at it from underneath. This one is perfect. No rust inside the lamp housing either and the lens appears to be un-cracked and free of scratches. Here's a rarity… a vinyl saddle without any rips in it! These are notoriously torn and worn. Not this one. Just a bit dirty. These Dunlop 16 x 2" cream colored balloon tires are no longer available. As you can see from this photo, the tires are still serviceable, but are breaking down a bit. 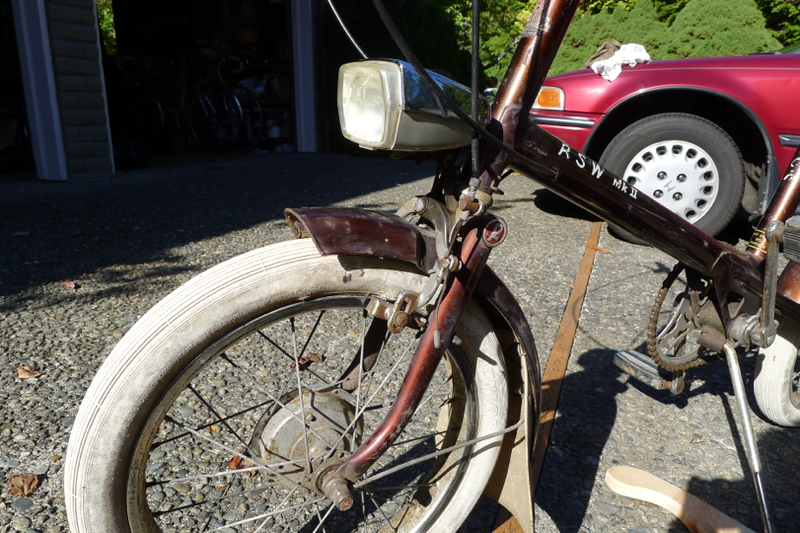 My plan for this bike is to remove the white bits: tires, pedals and saddle, and store them for posterity. I'll clean her up, rebuild the bottom bracket, hubs and headset and install some new tires, brake pads saddle and pedals, get the Dynohub working then…. ride it! 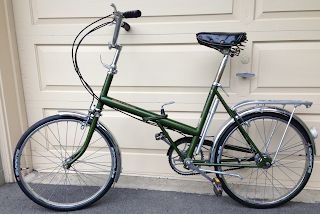 Here is an image of the same bike, now with the parts set up for riding. Comet 16" tires, a cheap set of platform pedals and a cheap vinyl saddle. I usually swap out a Brooks B-66 between bikes, so this saddle is just a filler. The Dynohub and the AW three-speed have both been completely rebuilt. Lighting system is now functional (if you can call the lighting from the 60's "functional.") This bike is actually pretty fun to ride now. I wonder what it would feel like to put some significant (>25) miles on her… ?? 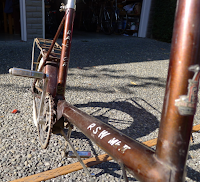 I guess I've considered the Sturmey Archer 3- Speed to be a black box in a way. 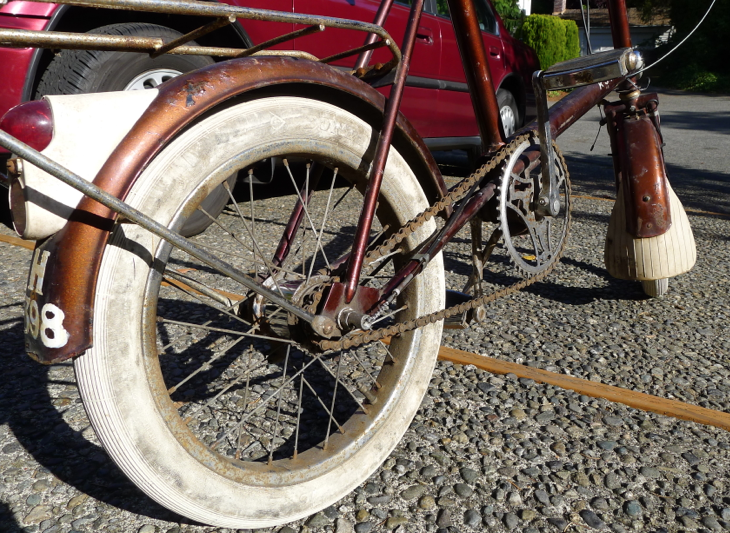 A wire goes into it, you flip a little lever and all of the sudden, it gets easier to pedal! It's a silver "box." Well, no longer. I've read a number of sites about the rehabilitation of SA hubs. THIS one in particular was very inspiring to help me gain confidence. After putting it off for a few days, I had no excuse this morning but to dive in. Here is the hub innards splayed out on my bench. The only tools I needed are laying there as well. It's one thing to tear something apart, but putting it back together again can be difficult. Not these. I even ended up pulling the pawls and pawl springs out and cleaning them. The pawl springs are as fine as hair! Anyway, the whole thing went back together with some fresh grease on the bearings and 3:1 Electric Motor oil in the gear compartment. 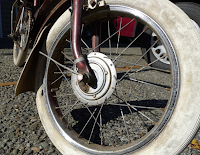 Once I got the wheel mounted back on the bike, I was AMAZED at how well it rolled and shifted. Now I'm going to be working through the winter to do all the other bikes I have... by the time spring comes.. I'm going to be an expert at this. 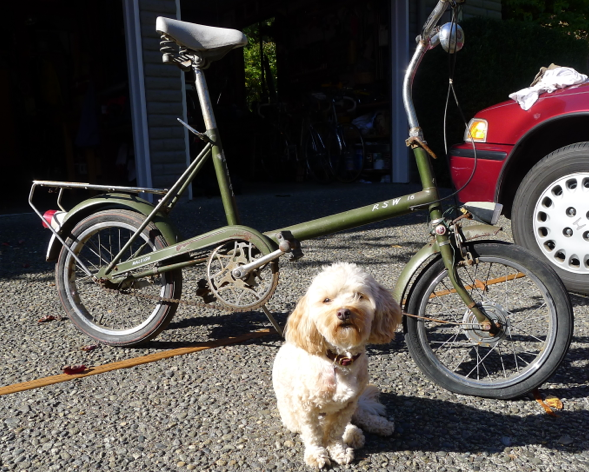 Here's the second bike I picked up on a trip down to Portland... a gold Phillips Twenty! Needless to say, this is still a work in progress to get it cleaned up and running again. Luckily, I have an extra front wheel in real nice shape. 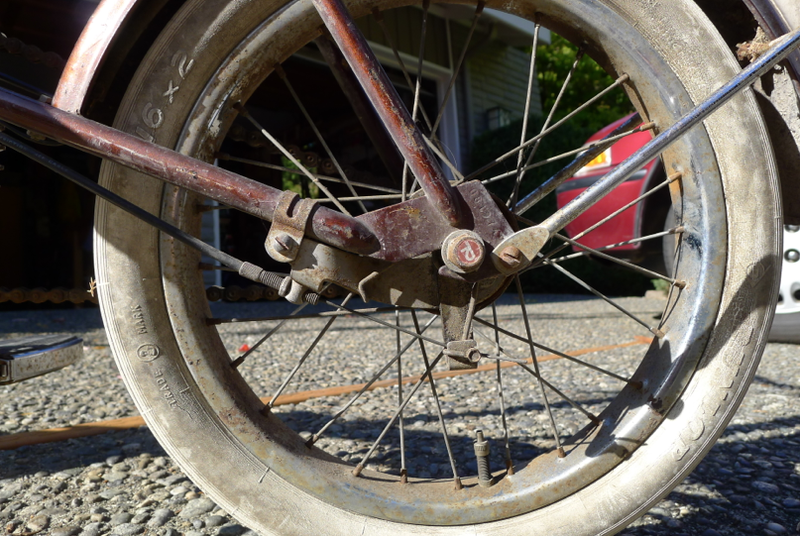 I have worked out a deal with a co-member of the http://raleightwenty.webs.com site for a replacement rear wheel in decent shape, so that should take care of the wheels. I had an extra seat post and passable saddle. It's coming back together nicely. As soon as I get some updated pics, I'll add them in. So, what does all this mean? I think I have ALL the colors of Raleigh (branded) Twenty's: Carmine, Blue, Green, Brown , White and Orange. And with this one, a Phillips branded Gold one. Seven Twenty's! This Gold Twenty is now done. The rear wheel arrived from my pal grumpyoldsquid on the Raleigh Twenty site. 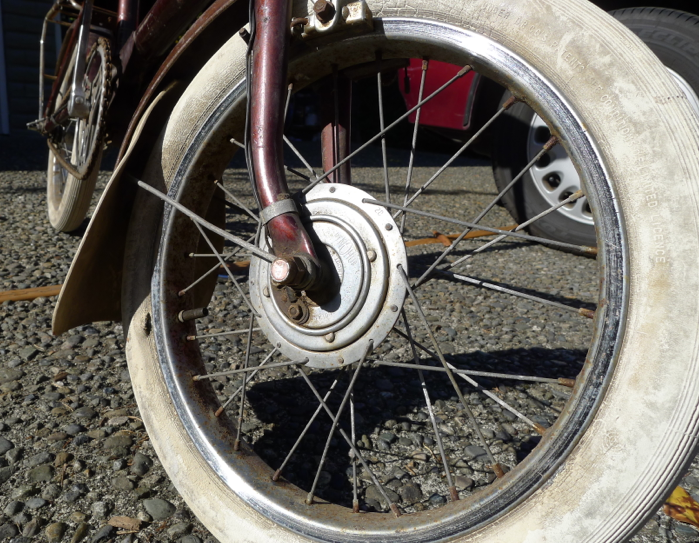 It was in decent shape, but since I had it out of the bike, I used it as my first Sturmey Archer teardown wheel. See the guts HERE. Once I got it all back together, it looks pretty sharp. Rides pretty well too! 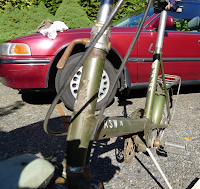 The paint is still pretty rough and there is some rust on the cranks that wouldn't come off, but overall, and particularly from a distance, it looks pretty stunning in Gold and Silver... Here are some pictures of the final product. Here is the freshly re-built hub and Grumpy's wheel. New 1/8" chain too... clean! Like I said, the frame itself is pretty rough. Here is the remnant of a sticker near the hinge. I just left it for "cred." 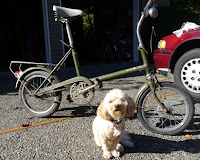 I've added a couple new bikes to my Raleigh Twenty collection, the first being this carmine red example. 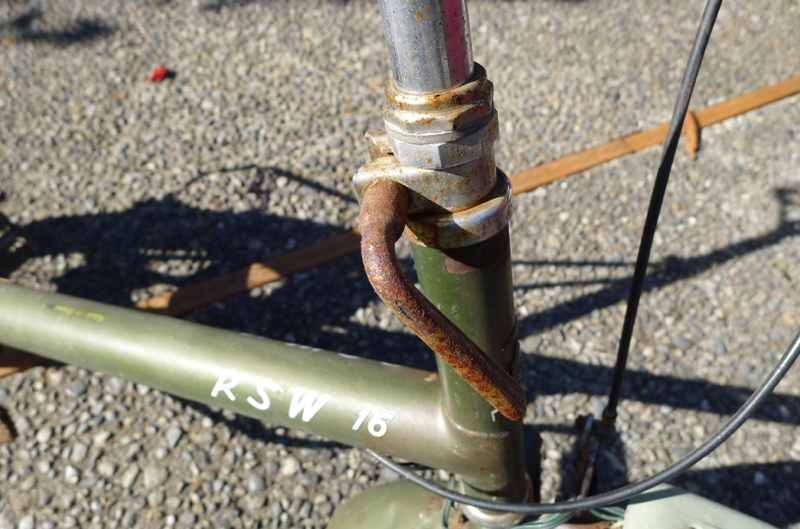 The fork on the original bike was actually a Raleigh threaded fork, but probably from a Sport. It had been cut to a length that allowed a quill stem to be added. Luckily I had a spare brown fork laying around and a rattle can of red that was almost an exact match for the red of the bike. The chain guard was also in pretty rough shape, so I sprayed it out too. The finished product looks fantastic and riding on those 451 rims makes this bike very responsive and fun. This image (courtesy of bringthenoiseuk.com) is from The Who's movie Quadrophenia. 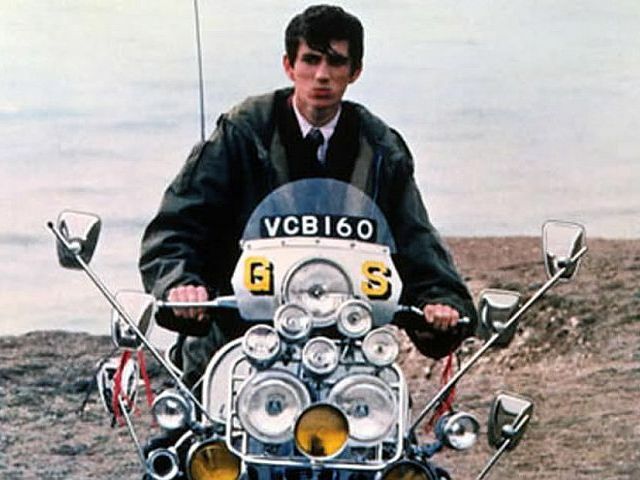 I remember how amazed I was at the sub-culture of punks in England at the time who pimped out their scooters like this. Since I had a Vespa at the time, I could kind of relate. I also had a trench coat and my girlfriend had electric blue hair. I loved it! Well, look at the Raleigh Twenty I found on Criagslist yesterday! I MUST stop looking at craigslist. This is the kind of thing that happens. 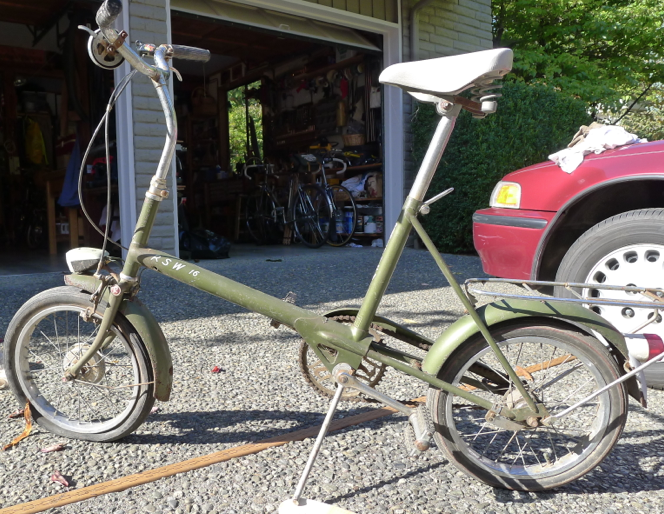 Last night I was sitting on the computer scanning through the listings for "Raleigh" and came across a "Raleigh Folding Bike." I clicked in and saw this bike. The first thing I noticed was the front rack. I had seen a rack like this on a bike recently found in Ireland. 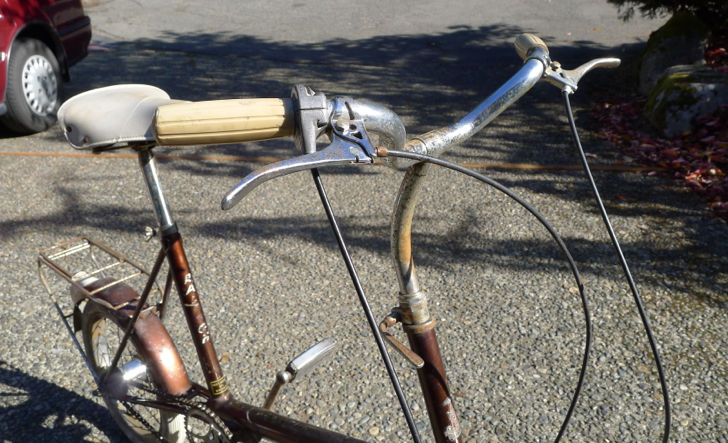 I think this idea of a "randonneur" Twenty would be kind of fun. The hunt began for front racks with short stays... nada. Until yesterday. And in my own back yard! 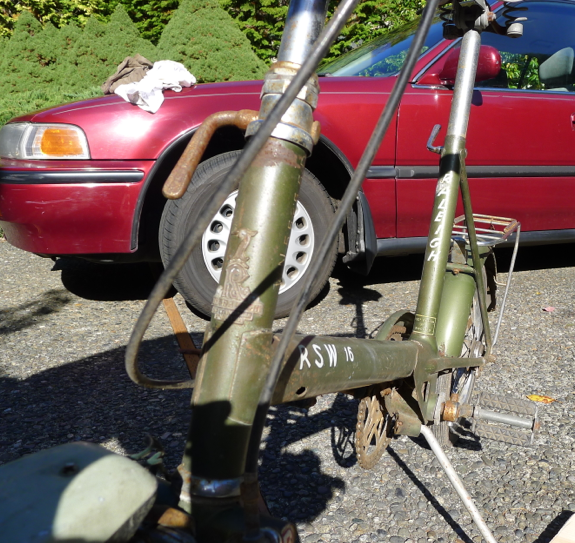 It turns out this bike sat all day at a garage sale with no interested parties. 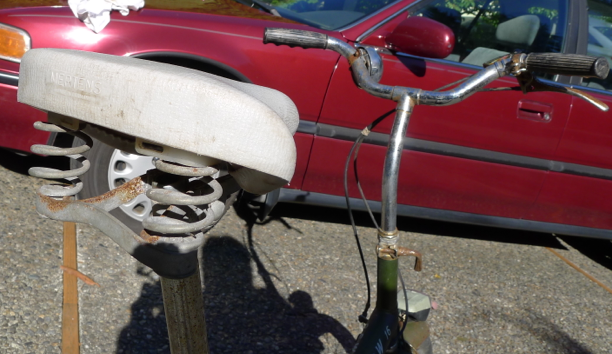 The grandson of the woman who lived in the house posted a few remaining items on craigslist and that is how the bike got there. I called, but he was already gone, headed back home to Everett, WA. I asked if it was OK to go over and see it, possibly to buy and he indicated his grandmother would be there. "Twenty" minutes later, after a stop to the cash machine, I was there. But she wasn't. I waited, knocked, waited, walked up and down the street, tried again. I probably looked like someone casing the place. Thirty minutes passed and I called the guy listed in the ad. "Just head on back behind the house. It's under a blue tarp. If you like it, just leave the money in the mailbox." 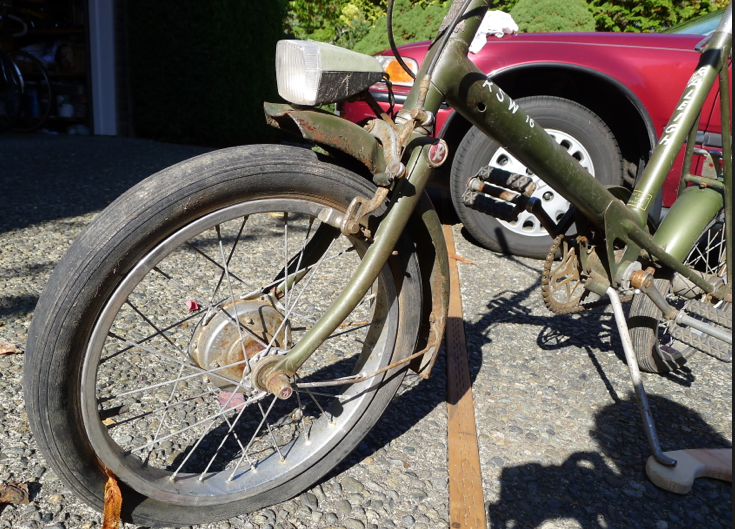 We talked price a bit, and without giving it away, I picked this bike up for sub-$100. Very sub-$100! They needed to clear the decks. It was a win-win. Once I got it home and into the light of my garage, I could tell this bike has seen almost no riding. Very dusty. Good, not mud. No rust. It had been stored inside all these years, probably a basement corner or back of a garage. There was a real tacky sheepskin cover on the original Brooks mattress saddle... in PERFECT condition! These saddles are notoriously delicate and usually rip out. Not this one. Low miles and a sheepskin cover saved it. No rust on the springs and even the underside is pure white. Look close... a headlight! 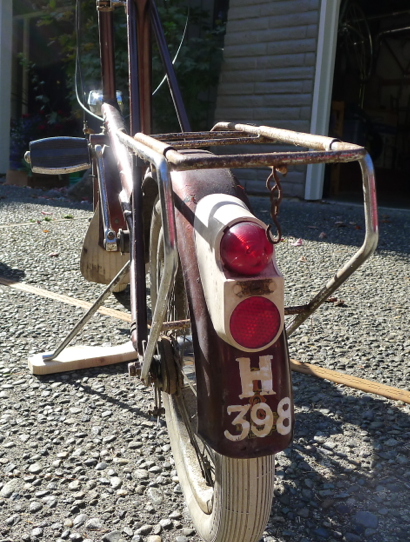 Battery powered, to go with the TWO pop-bottle generator driven lights on the front. All three work (after freshening the batteries) And, yes, that is a chrome air pump too. There are only two things wrong with this bike. First, it is missing the chain guard. Not that big of a deal, they come around often enough. 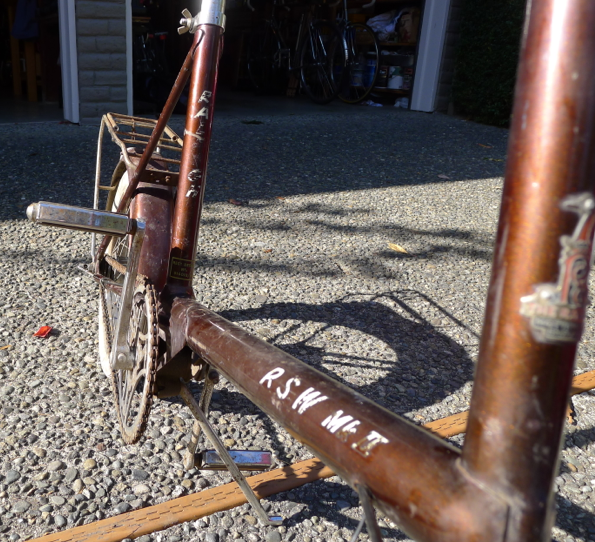 I think I might even have a brown one in the shed... Second, and of a little more concern is that the Sturmey Archer AW hub (dated 5-75) was free wheeling in both directions. I added a dab of oil, and spun it. No good. Shot some Tri-Flow down the hole and now I can get second and third gear. After patching the flat, I tinkered with the adjustments, but I cannot seem to get first. Plans? Clean her up and get the hub working. 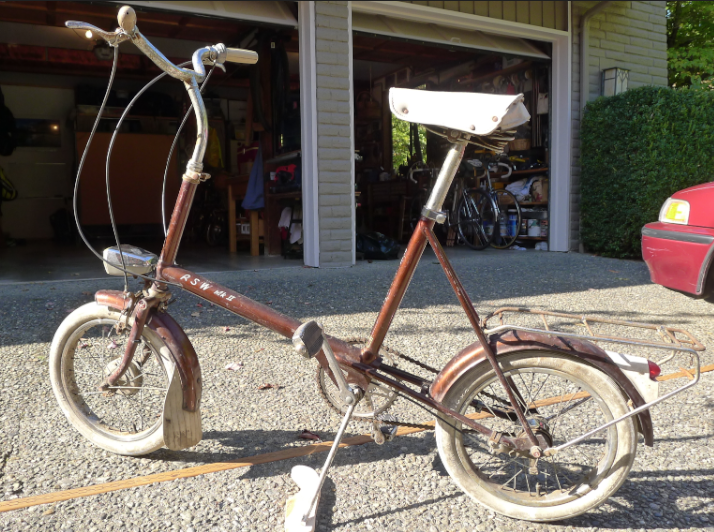 This might just be a nicer root beer brown bike that the one I currently have. I may swap out a few parts, build this one up to be my keeper and sell the other. It's still pretty dusty, but I can tell the decals are nice and it doesn't have many, if any scratches on it. 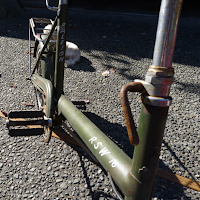 I recently came across a couple of Raleigh RSW's on eBay that were being sold as "local pickup only" down in Nehalem, OR. Nehalem is just east of Manzanita, a coastal town the family and I frequent almost every summer. I knew it was going to be a stretch for the seller to get many bids, seeing that people would need to go to the Oregon Coast to get them, so I put the bids in. Bike number two is a RSW 16. Even our dog Hazel was disappointed! I had just returned from a trip with my eldest son, and traveling with bikes was really on my mind. But NOT these bikes. Too heavy. And not Twenties. Too heavy and not small enough. So what to do? 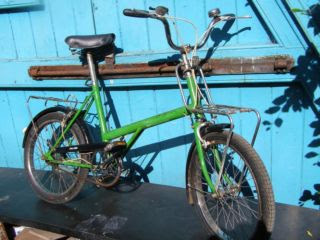 Sell these and get a Brompton!! More to come on THAT decision..
Bikes coming and going. We moved to a new house (more storage - yeah!). Working again..
- My eleven year old's bike. He LOVES his R-20. 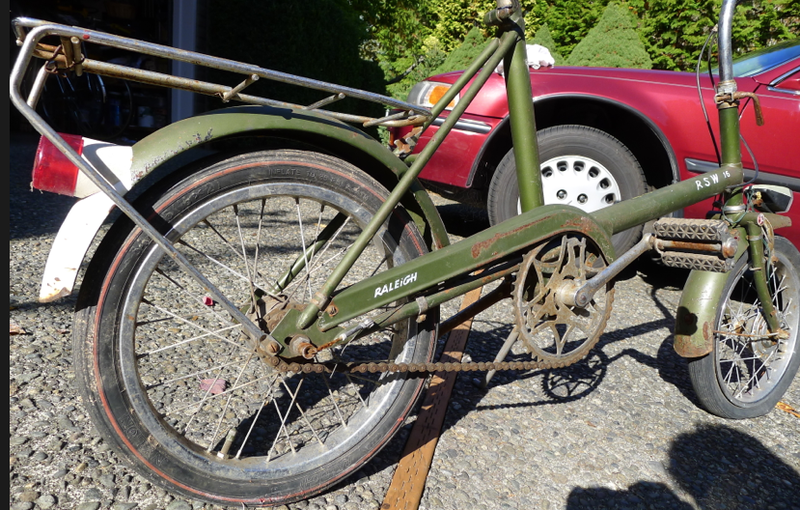 It's a really nice green frame with 20" 451 narrow wheels. I have a set of Schwalbe Durano's only pumped to 80psi so the road shock isn't too bad. It really moves and is very nimble. - Our electric bikes. 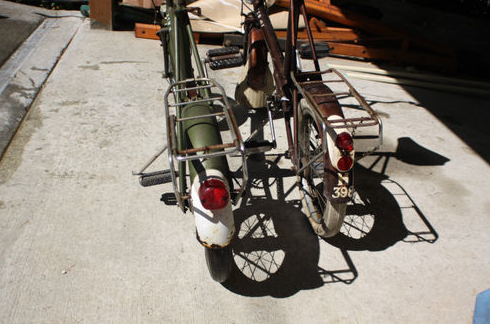 These are two Twenties we converted into electric motor bikes. Second, I finished a custom re-build of my red Raleigh International frame. Powder coated gloss black with gold pin striping and a fresh decal set, full Campy Nuovo Record, hammered fenders, Brooks saddle and bar tape... this bike is a dream. 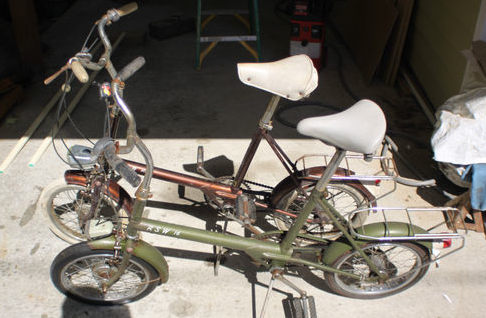 I plan on making it my main ride this spring and summer. Third, and most extravagant, we are now members of the Cult Brompton.